In November 2017, I took the plunge to join One on One, and it was life changing. I could not have done this journey alone. My spark came from the knowledge, professionalism and energy at One on One Fitness. The positive attitude of the entire Team (as well as the other clients) is tremendous. After being diagnosed with Thyroid Cancer and gaining almost 50 pounds over two years, I believed I would be stuck at this weight for the rest of my life and “deal” with being overweight. However, after only two weeks at One on One, it was clear that I could lose weight and get my body to where I wanted it to be. In early July of 2017, I came to the realization that, in order to live my life to its fullest, I needed some serious help to get back into shape. At 357 pounds, daily tasks were becoming increasingly more difficult as my weight continued to climb, and I could feel a rapid decline in my health. I once lived with the constant struggle of being overweight. Fad diets, aching joints, and weight fluctuations literally weighed me down. In 2015, after discovering I was at the highest weight of my life, I was officially at rock bottom. It was time for a change. Mind and Body : Commitment and Balance Heart and Soul : Understanding and Passion These words come to mind when I reflect on my year and a half at One on One. These words describe One on One the organization and One on One the staff and trainers. These words describe what One on One has instilled in me – both ‘on and off the court’. I have been a One on One client since May of 2005. I went to them because I was a long-time sufferer of lower back pain. For over 30 years I had been trying various medical procedures to “fix” my back but none provided long-term relief. The constant pain and occasional debilitating flare-ups had significantly deteriorated my quality of life. Exercising was the last thing I felt like doing because I was afraid I would hurt my back even worse, but I was desperate to try to find a solution to my back problem. I was immediately impressed with the thoroughness and professionalism of my initial consultation with Kym. She seemed to understand what I had been through & what I was going through at the time. Even though I had such a long and problematic history of back pain, Kym was confident that her program could help me. I was skeptical but was willing to give it a try. We strongly recommend One on One, Fitness Consultants Inc. as a vendor of choice in providing fitness benefits in a corporate setting to any corporation who is serious about implementing a state of the art fitness program for its employees. Minitab entered into a business arrangement with One on One in 2004 in an effort to keep our low risk employee population stable and potentially motivate our high risk employee population to migrate to a low risk active lifestyle by encouraging participation in our corporate fitness programs. The goal was driven by a business necessity to control our future health care costs since our utilization reports indicated that at least 75% of our potential health care issues occurred in potential lifestyle disease and not catastrophic instances/shock claims. Virtual training at One on One is far more valuable than I even imagined. In February 2016, it was time to take my health and fitness seriously. Living in Washington D.C., I had many options, but decided to choose One on One in State College because of their reputation for delivering real results. I wanted results, not just an exercise experience. I just wanted to take a moment to thank you for everything you've done in my first 9 months with One on One. In February, I had a day off and stepped in on a whim, just to see what this place was. I'd noticed it while in physical therapy next door. Sitting in the lobby, my tailbone hurt so badly I could barely touch the cushions. And that was after two years of physical therapy, drugs, doctors, and pain. My last-resort recovery plan included a chiropractor and physical fitness. My first few weeks were daunting. Could I get there twice a week? What about work? Kids? Errands?Guilt? And can I really not kneel on one knee without falling over or do a single squat correctly? Top off the guilt with some gloom. Eventually you and John helped get me to a modest level of function, and things felt a little better. Then there were illnesses, travel, etc. - all the things that cause fitness ups and downs - but you helped me keep at it. Then this fall I noticed a few things. I could sit without pain. I didn't wince getting out of a car. I didn't have to survey the room for what chair would hurt least. What's more, is that a bicep muscle I see? An honest to goodnesss muscle? I was a member of a 24-hour gym and was not seeing any results and lacked motivation. It was then that I made the decision to work with a personal trainer to help achieve my health and fitness goals. When I did a search for local places, One-on-One Fitness was at the top of the list. Just looking at their website (reading their approach, reviewing the Staff Bios, looking at the services offered) provided the affirmation I needed that I was heading in the right direction. “Soon after I started working out at One on One Kym stopped by to say that I always seemed to be smiling. Last year after 4 ½ months with a slowly healing broken leg, any movement was truly pleasurable. But, that smile also represented a bit of self-satisfaction at getting the help I needed to get my leg and body back in shape. I have always been active and enjoyed outdoors adventures, but years of long work hours and other commitments had reduced my exercise time and intensity and allowed the pounds to creep on. I attributed my lack of energy to getting older. When I started Group Training at One on One in 2012, I was overweight, had high cholesterol and lost my breath simply mowing the lawn. I needed to start exercising, but, like many of us, was apprehensive about getting started. However, with the encouragement of friends and neighbors, I decided to "show up." As I reflect, I'm pleased to say it was one of the best personal decisions I've made in my entire life. My health has improved significantly. I have lost an unhealthy 20+ pounds and have had my cholesterol and blood pressure medications cut in half! One on One University has been a blessing to me. I entered my senior year of college with uncertainty about my career, but I knew I had a passion for fitness. Although I was earning a degree in Marketing, I wanted to meld my passion with my career because I know that makes many people successful and fulfilled with their work. Once I decided to spend the summer in State College, I searched fitness centers in State College on the web for a place of employment. Let me first say that my prior training knowledge came from a couple of bodybuilding books and tips I learned in the gym from friends, and I was misinformed on many things. I knew that before I could be a personal trainer, I would need to improve my knowledge and skill level in training others. Fortunately, I discovered the One on One website and the One on One University program. General Douglas MacArthur, as he turned the final page on his storied military career, offered this somewhat somber observation. “Old soldiers never die, they just fade away.” Apparently, he foresaw retirement as an uninspired, dwindling, and nonessential period. Not so for me! I view retirement quite differently. Closing one door only means opening another to new, diverse, and exciting opportunities. One-on-One was such an opportunity…it offered a program of inspiration, rejuvenation, and relevance. If one committed to their program, then one could enjoy a solid foundation for an active, vigorous lifestyle. Following hip surgery and the appropriate therapy, I was in need of a program specifically designed to help me regain physical fitness. Kym Burke at One-on-One proceeded with great care and caution to alleviate my restricted mobility and to improve my muscle tone, flexibility, and cardiovascular fitness. When I first came to One on One Fitness, I knew I needed help. I was overweight and couldn’t climb a flight of stairs without breathing heavily. The professional approach and non-intimidating environment made me comfortable from the start. When I first came to One on One four years ago, I was 50 years old and weighed almost 300 pounds. I had no energy and felt terrible. It was time for me to take ownership of my health and stop making excuses, which should have been easy…I am a shareholder of another local health club! Having access to a facility was obviously not the answer. I needed to work with professionals who could understand my challenges, see my vision and have the expertise to help me succeed. One on One has been the answer. In 2001, I was diagnosed with Fibromyalgia, a disorder that causes widespread pain all the time. I was out of shape, overweight, and facing a future that included high blood pressure, high cholesterol and diabetes. I was in pain and unwilling to face a future that included medication and further medical complications. In February 2007, I decided enough was enough and started working out with One on One through my employer, Minitab Inc. When I decided to start One on One’s Personal Fitness program in June of 2005, I was 44 and brand new in town. I knew the kind of life I wanted, but how to realize and live my vision was certainly not clear to me. I felt overwhelmed. I was overweight, anxious and not sure what I wanted to do with my life. Exactly two years later, I was three sizes smaller and enjoying the best health of my adult life. I was astonished with the results. The experience was so amazingly positive for all aspects of my life that I made a decision to become a fitness professional myself. I’ve always realized that I needed to get serious about my level of physical fitness. I had always “talked” about exercising more and even dabbled in various DVD programs – nothing stuck and quite frankly, I hated to exercise. It was a chore and I often times found excuses to do something else. However, in the spring of 2012, it became different, I had reached a point in my life where my medical health wasn’t the greatest, layer in my age and my family medical history, I was slowly increasing my risk of establishing lifelong medical issues. That scared me. It was then that I started my journey. I really appreciate Lonny’s ability to communicate openly and be understanding of the obstacles I sometimes face while still having high expectations. When I came to One on One I had been told by many therapists all of the things I shouldn’t do. Have you ever been in a place where fear has hindered your desire to change? What did you do the moment came that your desire to change overcame your fear? I was in my car, after another lunch out, and decided I was tired – tired of feeling badly about myself and my habits. I had heard about One on One through friends and decided to stop by to get information. It was the best decision I’ve made in a long time! 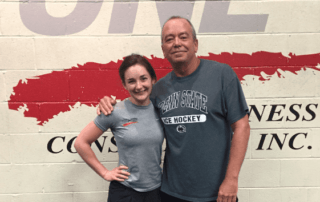 I just wanted you to know that my experience with One on One in State College has been nothing but the best. I feel very forunate to have found and joined your fitness center. I have made great strides in my fitness level, lost 3 inches from my waistline and have noticed that my endurance level and strength is getting stronger every month. I feel better physically now than when I was a much younger person. I was diagnosed with depression a couple of years ago and I have discovered that my workouts are helping me feel better mentally as well as physically. I’ve been working out at One on One for over five years. At the start, no sweat and no pain was my mantra. I started out as an overweight couch potato with serious pain from an arthritis-like condition. I was also a very reluctant exerciser who needed lots of instruction and encouragement. First, I want to congratulate you on winning the 2010 CBICC Corporate Philanthropy Award. You have worked very hard to grow your business and your reputation…and it shows. I also want to say thank you. Returning to One on One was one of the best decisions I have made. Since turning the big 5-0, I had been biking four to six days a week, kept a food diary and lost 60 pounds. However, I knew I was not getting it all done correctly. In 1989, I had some cartilage removed from my knee. It was a fairly simple operation, but I couldn’t get it back to normal. That is when I first came to One on One and began what has been a long, very successful relationship. Like many people my age, I’ve experienced a number of medical issues over the years. That first knee surgery was 20 years ago. Since then, I’ve had a disc removed from my back, heart bypass surgery and an operation on my other knee. In addition, I was in a car accident five years ago. I wasn’t injured badly at the time, but several weeks later I developed whiplash and the pain was miserable. Another kind of success: Staying the course At One on One, we see many kinds of success stories. Some are dramatic and overtly visible in short time-frames, others are realized over years and decades. Lynn Myers is one such long term success story. She is a great example of how consistent exercise over the long haul can minimize the negative effects of aging and our environment. “Nothing tastes as good as fit feels … but with the conscious change in nutrition, even the “healthy” choices are tasting better.” I could always stay a step ahead of my boys … until last summer when I couldn’t even keep up. As a coach, I felt I was letting them, and myself, down. One could argue that aging closed the gap and, yes, weight was holding me back. But I was determined to fight it. I have known Bruce and Kym for almost 20 years. However, since I live 50 miles away from State College, I never thought that working with them was an option. What a big mistake that was. I have had many injuries over the years and they’re starting to catch up with me. The exercise I was doing on my own was probably hurting me more than it was helping, but I didn’t realize it until I decided to try the new “To Go!” program. The only regret I have is that I didn’t come to One on One sooner. Your listing of February client anniversaries reminded me that it is now 4 years since my life started changing for the better when I walked in the door at One On One. My how the time flies– I’ve enjoyed every bit of the time spent there. 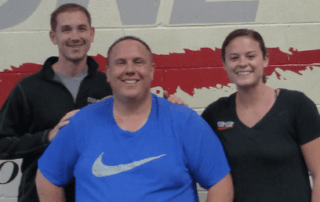 As a result of your program and your highly professional and competent staff, I have come a long way toward reinventing myself and achieving a level of fitness that I thought I’d never see again in my lifetime. For 14 years my two sons have been healthy, active athletes. Last April, Cole, then 14, had to have knee surgery for a growth issue and would have to spend at least 12 weeks in a brace. The brace was scheduled to come off in July, with ninth grade football starting in mid August. How would he ever be ready? 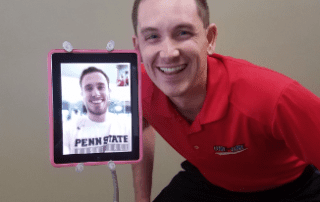 Kym Burke, who was training my mother at the time, gave me a call and patiently explained that he did not have to wait to train…that One on One could work with him while in the brace. She assured me that he could be healthy, strong and fast by the time his fellow ninth graders were tackling him. Ahhh….music to a mother’s ear! It worked beautifully. I just have to share my story because One on One Fitness has made such an impact on my life. Kym and Bruce have done an amazing job with this business. For starters, the trainers are professional yet very friendly. In the year and half that I’ve been with One on One, I have been pleasantly surprised every time a new trainer comes on board. I keep waiting for the one that isn’t quite up to par with the others but it just never happens! Every trainer, as I already said, is very friendly and professional! This tells me that Kym and Bruce have a keen eye and unwavering standards for the people they hire. If you are a trainer at One on One, you should consider it a compliment and acknowledgement of your excellent qualities as a professional. What a difference you have made in my quality of life! Until I started working out at One on One, I had never exercised regularly for more than six months at a time. I was never an athlete and truly hated exercise, so staying with a program was a little like taking unpleasant medication that I would rather avoid in spite of that fact that I knew it was good for me. As I was approaching the “Big Five-Oh,” I became more concerned with my future quality of life. I finally began to realize that I needed to work at staying fit and healthy for the next half century of my life if I was going to enjoy it as much as the first. The first time you met with me, I was extremely nervous. I knew I needed help, and I didn’t want to look bad! Not only did you make me feel good about taking that first step toward fitness, you continue to encourage me every step of the way. I joined One on One 10 years ago, right before turning 40. It was one of those milestone moments where you feel like you need to make a change before the next big birthday. Even though I had been exercising pretty regularly up until that point, I felt like it was time to do something different. Not long after joining One on One, it became obvious to me that this was much different than any other gym I had previously belonged to. I really felt that I became part of a team, and that we were working together to figure out what I wanted to achieve, and how we were going to do it. Over the past 10 years my goals have ranged from health to vanity and everywhere in between! And every time I felt like it was time to step it up or make a change, I not only had a wealth of knowledge to back me up, but an energetic, warm, and friendly support system to take the journey with me. One on One Fitness is about making a positive, sustainable change to your lifestyle and habits. The sessions are designed specifically for you: No generic, one size fits all type workouts. The results are gradual, steady, and lasting, because you actually make a healthy change to your exercise habits. As the years go by, your goals change and One on One changes with you. For example, I no longer feel I need to have the biggest biceps in town, but I started a Personal Yoga Program at One on One. It’s great! One on One has worked for me for nearly 20 years! Since joining One on One, I have lost weight, put on an incredible amount of muscle, reduced my stress and blood pressure, and feel stronger than I ever have. Most people would agree that One on One is a bit of a “splurge” when you consider the cost of memberships at other gyms, but I feel that it is worth the price every week. I can’t imagine a better fitness center, and I’ve trained in excellent military gyms around the world. When I came to One on One four years ago, I really needed some help to return to my previous fitness level, which I had maintained for years as a Marine officer and an all-American athlete. I had recently gained weight and lost my focus on fitness. 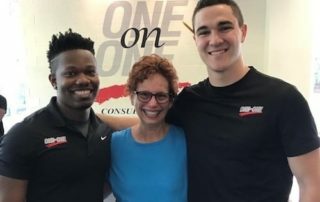 A prompt and friendly greeting led to meeting my personal trainers, whose knowledge and professionalism eclipsed that of all the other trainers with whom I have worked. They discussed my goals with me and developed a personalized approach to helping me meet my goals with excellent attention to detail. When we retired, we had to make a decision as to what we would do with our free time. Our wish was to have an active retirement devoted to backpacking, canoeing, and related activities, preferably in a wilderness setting. We soon realized that this program would require considerable changes in our fitness levels for both strength and endurance. Thus we began a program of regular workouts at One on One that turned out to be a wonderfully effective way to reach these goals. On a whim one Saturday morning in December 2011, I walked into One on One and had the pleasure of speaking with Kym Burke. I had my left hip replaced in early September, did the required physical therapy, but realized I still needed help. I could not get off the floor without using my arms to pull me up, was not sure if I could cross country ski again, and getting into my SUV was difficult. I lacked strength and rotation in both hips. I immediately decided to sign up and dig into the 24 coached exercise sessions. I am so thankful I did! With the skilled guidance, pushing and encouragement of the trainers, I persisted and significantly improved! I was “sore” for 2 months, but it was worth every minute of the effort! I am a 72 year old retired Penn State professor and an enthusiastic client (I prefer the “title” of trainee) of One on One. I was very active playing handball from about age 10 to 50, with tennis added in the summer. From about 50 to 60 I switched to racquet ball, a less strenuous sport, but still one in which you chase a ball, my requirement for a fun sport. At about age 60 I started to lose vision in my right eye and the depth perception that goes with it, so I had to stop chasing fast-moving balls and quickly became an out-of- shape couch potato. During this time I observed my wife, a One on One trainee, going in the opposite direction. She was getting more energy, stronger, better posture, and she claimed that she actually enjoyed working out at One on One. After a couple of months her urging me to give One on One a try, I gave in. Two years later I am happy to write this enthusiastic fan letter describing my experience. 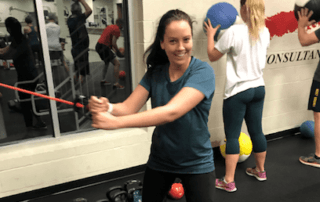 I recently completed One on One University’s 8 week Personal Fitness Training Instructor Program and would like to say a few words about my exceptional experience. I couldn’t imagine having the same opportunity anywhere else. I am currently working on my Undergraduate Degree in Kinesiology. The training I received from One on One University’s Training Program has enabled me to have a true hands on experience. No cadavers or online presentations, just real life physical applications. This course finally helped me understand and combine all of the knowledge from my classes by seeing movement science in motion and practically applying it to the human body. Where do I start- I’m sooo happy with every part of my training experience at One on One. When I started I was overweight, had no balance and no flexibility. I never thought I would consider my upper body as “normal” after all of the many surgeries I have had. However, with each session my confidence, balance, flexibility and strength continues to grow and has already far exceeded my expectations. I have never touched my toes even when I was in top swimming/dance/running shape…but now I can! It blows my mind what I am now able to accomplish in a training session. I have much better balance and flexibility, and feel stronger than ever. Thank you for all you have done for me in my four months of training. I have truly never been in such a great place physically and emotionally; I know that this is because of the lifestyle you all have introduced to me. I may complain a lot, but I never regret a workout and always look forward to my next one because once you realize how great exercise makes you feel, you can’t understand how you went without it in the first place. I think that everyone exemplifies my Grandpa’s quote above. I get at least three or four “hello Kristin” every time I arrive, from trainers who don’t even train me! A little more than twelve years ago, I was working eighty-plus hours a week, under constant stress and filled with anxiety. My physical condition – overweight and with both high blood pressure and high cholesterol – was the product of a lifestyle of too much work, and too little physical fitness. I was pushing 50-years old and the perfect candidate for something unpleasant to happen. I have lost 46 pounds, many inches, four sizes in clothing, and lowered both my blood pressure and cholesterol. I am much stronger and both my physical appearance and mental attitude have improved dramatically. I accomplished much more than I ever expected in a short period of time. I feel wonderful! It was the summer of 2008 that I decided to take control of my life again. I had been through some very stressful, emotional events and I gained a lot of weight. My eating habits were horrible.